Itoh, Y. (Ed.) (2013). 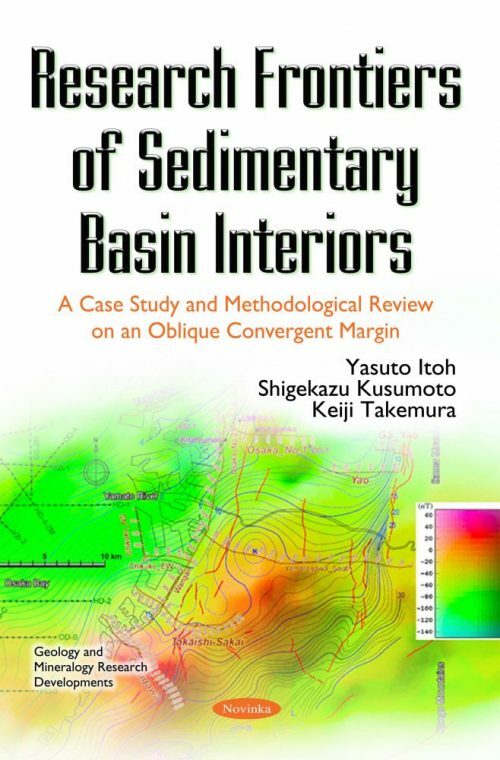 Mechanism of Sedimentary Basin Formation - Multidisciplinary Approach on Active Plate Margins. Rijeka: InTech. http://dx.doi.org/10.5772/50016. Itoh, Y., Kusumoto, S., & Takemura, K. (2013a). Characteristic basin formation at terminations of a large transcurrent fault - basin configuration based on gravity and geomagnetic data. In Y. Itoh (Ed. ), Mechanism of Sedimentary Basin Formation - Multidisciplinary Approach on Active Plate Margins. Rijeka (Croatia): InTech. http://dx.doi.org/10.5772/56702. Itoh, Y., Takemura, K., & Kusumoto, S. (2013b). Neotectonic intra-arc basins within southwest Japan - conspicuous basin-forming process related to differential motion of crustal blocks. In Y. Itoh (Ed. ), Mechanism of Sedimentary Basin Formation - Multidisciplinary Approach on Active Plate Margins. Rijeka (Croatia): InTech. http://dx.doi.org/10.5772/56588. Komazawa, M. (2004). Gravity grid database of Japan, Gravity CD-ROM of Japan, ver. 2, Digital Geoscience Map P-2 [CD-ROM]. Tsukuba: Geological Survey of Japan. Komazawa, M., Ohta, Y., Shibuya, S., Kumai, M., & Murakami, M. (1996). Gravity survey on the sea bottom of Osaka Bay and its subsurface structure. Butsuri-Tansa (Geophysical Exploration), 49, 459-473. Nakagawa, K., Ryoki, K., Muto, N., Nishimura, S., & Ito, K. (1991). Gravity anomaly map and inferred basement structure in Osaka Plain, central Kinki, south-west Japan. Journal of Geosciences, Osaka City University, 34, 103-117. Nakatsuka, T., & Okuma, S. (2005). Aeromagnetic anomalies database of Japan, Digital Geoscience Map P-6 [CD-ROM]. Tsukuba: Geological Survey of Japan. Okada, A., & Togo, M. (2000). Active Faults in Kinki. Tokyo: University of Tokyo Press, 395pp. Research Group for Active Faults (1991). The Active Faults in Japan: Sheet Maps and Inventories Rev. ed. Tokyo: University of Tokyo Press, 437pp. Barnes, G., & Lumley, J. (2011). Processing gravity gradient data. Geophysics, 76, I33–I47. Barongo, J. O. (1984). Euler’s differential equation and the identification of the magnetic point-pole and point-dipole sources. Geophysics, 49, 1549-1553.
gradient tensor to locate geologic bodies. Geophysics, 75, I37–I49. doi:10.1190/1.3484098. Beiki, M. (2013). TSVD analysis of Euler deconvolution to improve estimating magnetic source parameters: an example from the Asele area, Sweden. Journal of Applied Geophysics, 90, 82-91. doi:10.1016/ j.jappgeo2013.01.002. Blakely, R., & Simpson, R. W. (1986). Approximating edges of source bodies from magnetic or gravity anomalies. Geophysics, 51, 1494-1498. Cordell, L., & McCafferty, A. E. (1989). A terracing operator for physical property mapping with potential field data. Geophysics, 54, 621-634.
Cooper, G. R. J., & Cowan, D. R. (2006). Enhancing potential field data using filters based on the local phase. Computers and Geosciences, 32, 1585-1591.
Cooper, G. R. J. (2012). The removal of unwanted edge contours from gravity datasets. Exploration Geophysics, 44, 42-47. Dransfield, M. H., & Christensen, A. N. (2013). Performance of airborne gravity gradiometers. The Leading Edge, 32, 908-922. doi:10.1190/ tle32080908.1. Hofmann-wellenhof, B., & Moritz, H. (2005). Physical Geodesy. Berlin: Springer. on gravity and geomagnetic data. In Y. Itoh (Ed. ), Mechanism of Sedimentary Basin Formation - Multidisciplinary Approach on Active Plate Margins. Rijeka (Croatia): InTech. http://dx.doi.org/10.5772/56702. Kusumoto, S., Fukuda, Y., Takemoto, S., & Yusa, Y. (1996). Three-dimensional subsurface structure in the eastern part of the Beppu-Shimabara Graben, Kyushu, Japan, as revealed by gravimetric data. Journal of Geodetic Society of Japan, 42, 167-181. Lee, J. B. (2001). Falcon gravity gradiometer technology. Exploration Geophysics, 32, 247-250. Li, L., Huang, D., Han, L., & Ma, G. (2014). Optimized detection filters in the interpretation of potential field data. Exploration Geophysics, doi: 10.1071/EG13059. Ma, G. (2013). Edge detection of potential field data using improved local phase filter. Exploration Geophysics, 44, 36-41. Mickus, K. L., & Hinojosa, J. H. (2001). The complete gravity gradient tensor derived from the vertical component of gravity: a Fourier transform technique. Journal of Applied Geophysics, 46, 159-174. Miller, H. G., & Singh, V. (1994). Potential field tilt – A new concept for location of potential field sources. Journal of Applied Geophysics, 32, 213-217. Marson, I., & Klingele, E. E. (1993). Advantages of using the vertical gradient of gravity for 3-D interpretation. Geophysics, 58, 1588-1595. Nabighian, M. N. (1972). The analytic signal of two-dimensional magnetic bodies with polygonal cross-section: its properties and use for automated anomaly interpretation. Geophysics, 37, 507-517. Perdersen, L. B., & Rasmussen, T. M. (1990). The gradient tensor of potential field anomalies: some implications on data collection and data processing of maps. Geophysics, 55, 1558-1566. Reid, A. B., Allsop, J. M., Granser, H., Millett, A. J., & Somerton, I. W. (1990). Magnetic interpretation in three dimensions using Euler deconvolution. Geophysics, 55, 80-91. Rodrigues, R. S., de Castro, D. L., & dos Reis, J. A. Jr. (2014). Characterization of the Potiguar rift structure based on Euler deconvolution. Revista Brasileira de Geofisica, 32, 109-121. Shichi, R., Yamamoto, A., Kimura, A., & Aoki, H. (1992). Gravimetric evidences for active faults around Mt. Ontake，central Japan: specifically for the hidden faulting of the 1984 Western Nagano Prefecture Earthquake. Journal of Physics of the Earth, 40, 459-478.
gravity field model using Euler deconvolution. Geophysical Journal International, 187, 1-9.
ten Brink, U. S., Ben-Avarham, Z., Bell, R. E., Hassouneh, M., Coleman, D. F., Andreasen, F., Tibor, G., & Coakley, B. (1993). Structure of the Dead Sea pull-apart basin from gravity analyses. Journal of Geophysical Research, 98, 21877-21894. Thompson, D. T. (1982). EULDPH – A new technique for making computer assisted depth estimates from magnetic data. Geophysics, 47, 31-37. Torge, W. (1989). Gravimetry. Berlin: Walter de Gruyter. Danhara, T., & Iwano, H. (2009). Determination of zeta values for fission-track age calibration using thermal neutron irradiation at the JRR-3 reactor of JAEA, Japan. Journal of the Geological Society of Japan, 115, 141-145.
for the Uemachi Active Fault System by METI. Uji: DPRI (Kyoto University). Geological Survey of Japan (1997). Forgoing survey of main active fault in the Kinki Triangle No.18, Ikoma fault system, seismic reflection survey. In K. Shimokawa (Ed. ), Open-File Report, No.285. Tsukuba: Geological Survey of Japan, AIST. Geological Survey of Japan, AIST (Ed.) (2012). Seamless Digital Geological Map of Japan 1:200,000 (July 3, 2012 Version), Research Information Database DB084. Geological Survey of Japan, AIST (National Institute of Advanced Industrial Science and Technology), Tsukuba. Hirota, Y. (1991). Geology of the Sambagawa metamorphic belt in western Kii Peninsula, Japan. Memoirs of Faculty of Science, Shimane University, 25, 131-142. Horike, M., Takeuchi, Y., Toriumi, I., Fuzita, T., Yokota, H., & Noda, T. (1995). Seismic reflection survey of the boundary region between the Ikoma Mountains and the Osaka basin. Zisin (Bulletin of Seismological Society of Japan), 48, 37-49. Horike, M., Takeuchi, Y., Imai, S., Fuzita, T., Yokota, H., Noda, T., & Ikawa, T. (1996). Survey of the subsurface structure in the east of the Osaka basin. Zisin (Bulletin of Seismological Society of Japan), 49, 193-203. Huzita, K. (1980). Role of the Median Tectonic Line in the Quaternary tectonics of the Japanese Islands. Memoirs of Geological Society of Japan, 18, 129-153. Huzita, K., & Kasama, T. (1982). Geology of the Osaka-Seihokubu District, with Geological Sheet Map at 1:50,000. Tsukuba: Geological Survey of Japan, 112pp. Ikebe, N., Iwatsu, J., & Takenaka, J. (1970). Quaternary geology of Osaka with special reference to land subsidence. Journal of Geoscience, Osaka City University, 13, 39-98. Itihara, M., Ichikawa, K., & Yamada, N. (1986). Geology of the Kishiwada District, with Geological Sheet Map at 1:50,000. Tsukuba: Geological Survey of Japan, 148pp. Itoh, Y., Kusumoto, S., & Takemura, K. (2014). Evolutionary process of Beppu Bay in central Kyushu, Japan: a quantitative study of the basin-forming process controlled by plate convergence modes. Earth, Planets and Space, 66, 74. doi:10.1186/1880-5981-66-74. Itoh, Y., Kusumoto, S., & Takemura, K. (2015). Tectonically controlled asymmetric basin formation and evolution: an example from an active plate margin. In B. Veress, & J. Szigethy (Eds. ), Horizons in Earth Science Research, Vol.14. New York: Nova Science Publishers, Inc., pp. 123-141. https://www.novapublishers.com/catalog/product_info.php?products_id=57536. Itoh, Y., Takemura, K., Ishiyama, T., Tanaka, Y., & Iwaki, H. (2000). Basin formation at a contractional bend of a large transcurrent fault: Plio-Pleistocene subsidence of the Kobe and northern Osaka Basins, Japan. Tectonophysics, 321, 327-341. Itoh, Y., Takemura, K., Kawabata, D., Tanaka, Y., & Nakaseko, K. (2001). Quaternary tectonic warping and strata formation in the southern Osaka Basin inferred from reflection seismic interpretation and borehole sequences. Journal of Asian Earth Sciences, 20, 45-58. Kasahara, K., Aoi, S., Irikura, K., Iwata, T., Kudo, K., Horike, M., Ikawa, T., Kawanaka, T., & Mizohata, S. (1997). Seismic reflection and VSP servey on and around the deep well at Maishima and Kanku-Maejima. Programme and abstracts, the Seismological Society of Japan 1997, No. 2, P36. Kondo, H., Sugito, N., Yoshioka, T., Tsutsumi, H., & Kimura, H. (2015). Revisited spatial distribution of the Uemachi fault zone, Osaka, revealed by digital elevation models. Active Fault Research, 42, 1-34. Makimoto, H., Miyata, T., Mizuno, K., & Sangawa, A. (2004). Geology of the Kokawa District, with Geological Sheet Map at 1:50,000. Tsukuba: Geological Survey of Japan, AIST, 89pp. Miyachi, Y., Tainosho, Y., Yoshikawa, T., & Sangawa, A. (1998). Geology of the Osaka-Tonambu District, with Geological Sheet Map at 1:50,000. Tsukuba: Geological Survey of Japan, 113pp. Oka, Y. (1961). The geomorphology and the crustal movements in the southeastern part of the Osaka Plain. Geographical Review of Japan, 34, 523-535. Oka, Y. (1978). The formation of the Izumi range and the Osaka Group. The Quaternary Research, 16, 201-210. Osaka City (1995). Research Report for Uemachi Fault in 1995. http://www.hp1039.jishin.go.jp/danso/OsakaCtyfrm.htm (accessed 21 April 2016). Osaka Prefecture (2004). Subsurface Structural Survey of the Osaka Plain in the Heisei 15 Fiscal Year. http://www.hp1039.jishin.go.jp/kozo/osaka8 frm.htm (accessed 25 March 2016). Osaka Prefecture (2005). Subsurface Structural Survey of the Osaka Plain in the Heisei 16 Fiscal Year. http://www.hp1039.jishin.go.jp/kozo/Osaka9 frm.htm (accessed 25 March 2016). Research and Development Bureau, MEXT, & DPRI, Kyoto University (2012). Reports of Comprehensive Research and Study on the Uemachi Fault Zone (FY2010-2012). http://www.jishin.go.jp/main/chousakenkyuu/ uemachi_juten/(accessed 21 April 2016). Research Committee on Ground in Kansai (2007). Shin-Kansai Jiban (Ground of Kansai) - From Osaka Plain to Bay Area Rev. ed. Osaka: Association of Research on Geotechnical Information in Kansai, 354pp. Satoguchi, Y., & Nagahashi, Y. (2012). Tephrostratigraphy of the Pliocene to Middle Pleistocene Series in Honshu and Kyushu Islands, Japan. Island Arc, 21, 149-169. Wang, C. L., & Maekawa, H. (1997). Albite-biotite zone of the Sanbagawa metamorphic belt in the northwestern part of the Kii Peninsula, Japan. Journal of Mineralogy, Petrology and Economic Geology, 92, 43-54. Fujiki, T., Miyoshi, N., Morita, Y., Horie, S., & Takemura, K. (2001). Pollen analysis of an 800 m core sample from Lake Biwa, Japan. Proceedings of the IX International Palynological Congress USA (1996), Houston, Texas, 367-373. Horie, S. (Ed.) (1983). Paleolimnology of Lake Biwa and the Japanese Pleistocene 11. Kyoto: Institute of Paleolimnology and Paleoenvironment on Lake Biwa of Kyoto University, 99pp. Horie, S. (1991). Die Geschichte des Biwa - See in Japan: seine Entwicklung, dargestellt anhand eines 1400 m langen Tiefbohrkerns. Universitatsverlag Wagner, 349pp. Huzita, K. (1969). Tectonic development of southwest Japan in the Quaternary Period. Journal of Geosciences, Osaka City University, 12, 53-70. Meyers, P. A., Takemura, K., & Horie, S. (1993). Reinterpretation of Late Quaternary sediment chronology of Lake Biwa, Japan, from correlation with marine glacial - interglacial cycles. Quaternary Research, 39,154-162. Miyoshi, N., Fujiki, T., & Morita, Y. (1999). Palynology of a 250-m core from Lake Biwa: A 430,000-year record of glacial-interglacial vegetation change in Japan. Review of Palaeobotany and Palynology, 104, 267-283, doi: 10.1016/S0034–6667(98)00058-X. Takemura, K. (1985). The Plio-Pleistocene Tokai Group and the tectonic development around Ise Bay of central Japan since Pliocene. Memoirs of Faculty of Science, Kyoto University, Ser. Geology & Mineralogy, 51, 21-96. Takemura, K. (1990). Tectonic and climatic record of the Lake Biwa, Japan, region provided by the sediments deposited since Pliocene times. Palaeogeography, Palaeoclimatology, Palaeoecology, 78, 185-193. T., Otofuji, Y., Maeda, Y., Sasajima, S., & Horie, S. (1986). Magnetostratigraphy of sub-bottom sediments from Lake Biwa. Proceedings of Japan Academy, 62, 333-336. Yokoyama, T. (1969). Tephrochronology and paleogeography of the Plio-Pleistocene in the eastern Setouchi Geologic province, southwest Japan. Memoirs of Faculty of Science, Kyoto University, Geology & Mineralogy, 36, 19-85. Yokoyama, T. (1984). Stratigraphy of the Quaternary System around Lake Biwa and geohistory of the ancient Lake Biwa. In S. Horie (Ed. ), Lake Biwa. The Hague: Dr. W. Junk, 43-128. Yokoyama, T., & Takemura, K. (1983). Geologic column obtained by the deep drilling from the bottom surface of Lake Biwa, Japan. IPPCCE Newsletter, 3, 21-23. Wijns, C., Perez, C., & Kowalezyk, P. (2005). Theta map: edge detection in magnetic data. Geophysics, 70, L39-L43. Zhang, C., Mushayandebvu, M. F., Reid, A. B., Fairhead, J. D., & Odegrad, M. E. (2000). Euler deconvolution of gravity tensor gradient data. Geophysics, 65, 512-520. Contents of this book should attract broad audiences such as corporate experts, university staffs, graduate and undergraduate students engaged in geologic/geophysical survey, and should be especially useful to professionals in the field of active tectonics and environmental analysis.